"Saint Brigid was known to travel the countryside, blessing households as she went ... accompanied by a white cow with red ears. You should make her feel welcome, just in case she passes by - placing bread and fresh butter on the outside windowsill, together with corn for the cow, usually does the trick. Also remember to lay out some rushes for her. These are to kneel on while blessing the household. One was also advised to make fresh butter for Saint Brigid’s Day , maybe not a practical idea in modern times. You might, however, be willing to prepare a special dinner for Saint Brigid’s Eve. And remember that Saint Brigid’s Day was also a day for those who have to give food to those who haven‘t. 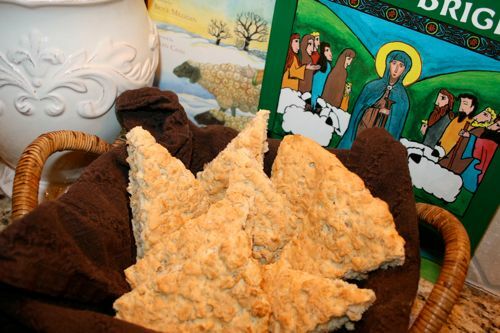 In many regions a special oat bread was baked for Saint Brigid’s Day - Saint Brigid’s Bread. [You’ll find the recipe below] – but remember that ideally this should have been blessed by a priest and then shared." I made a loaf of this bread yesterday and it didn't last long! Next time I think I better double the recipe. Mix flour, sugar, baking powder, baking soda and salt in a bowl. Add butter bits and cut in with knife until mixture is crumbly. Add oats and mix well. Beat the egg with the buttermilk in a separate bowl. Make a "well" in the dry ingredients, then pour in the egg mixture and mix all with a fork until the crumbs hold together. Form the dough into a ball and knead (on a floured surface, about 20-25 times). Add flour if the mass is still too sticky to work with. Form the doughball into 8-inch round and transfer it to the baking sheet. Score a deep cross into the bread but do not cut through. Bake for fifteeen to twenty minutes, or until medium brown and a tester comes out clean. If you have children, don't forget to pull out a picture book (The Life of Saint Brigid: Abbess of Kildare , Brigid's Cloak with the study guide in Catholic Mosaic , or Saint Brigid and the Cows) to read to them. While listening to her story, they can color Charlotte's beautiful St. Brigid Coloring Page while you enjoy a warm cup of Irish Tea. At least that is what our family will be doing on her feast day this week! St. Brigid of Ireland, Pray for Us! Thank you for this post! St. Brigid is my patroness, and I always love finding more things connected to her and her feastday! Yum! I love Irish breads... so easy to make since they aren't yeast-based, and they always have oats in them!! I discovered a really tasty and cheap Irish Breakfast Tea... Trader Joe's! They sell a box of 80 tea bags for about $3.00!!! I had become addicted to the stuff and was drinking at least a cup a day, so I was excited to find one that tasted so good for so little money. This is a very easy to make recipe, which I love! Thank you so much for sharing it! This recipe was great. I even used a mixture of whole wheat and spelt flour and it still turned out wonderful. I ended up adding probably almost a whole cup of additional flour, but I thought the finished loaf was delicious! Very easy, too. I served it with a ham, leek and potato soup - perfect. Thanks! Erin~ That is great! Sure wish I had a Trader Joe's in my ares. Lenetta ~ Wow! That's a lot of extra flour. You know, I actually found two different recipes for this bread and the first listed only 3/4(?!) cup flour. . . It was still extremely sticky at that point, so I went with the second recipe. Next time I will use even more and see what happens. I made this bread yesterday and it's great. Thanks. Gluten free flour works too. St. Brigid is also an Eastern Orthodox Saint. 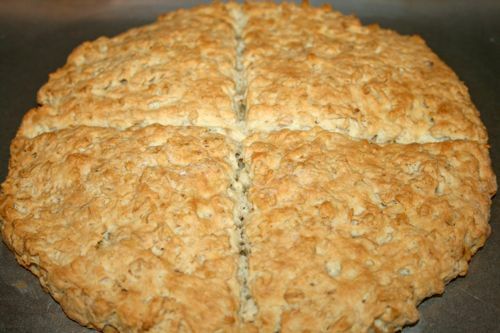 It’s traditional to make a feast day cake (or bread if your Saint has something special), bring it to Liturgy for the Priest to Bless and say a prayer. Then share with all. Orthodox have some food after Liturgy because we don’t eat before Church.